What is color? When I studied philosophy as an undergrad, it was always treated as a “secondary quality”, that is, something that’s not intrinsic to the nature of the thing itself. And while it’s true that how we see color is a subjective function of our eyes and processing in our brains, the colors of things is entirely dependent on the physical makeup of those things. When we see color, we are seeing into the atomic and subatomic nature of things. In other words, a tree is green in a forest even if no one’s around. To understand how color works, you need a little quantum physics. 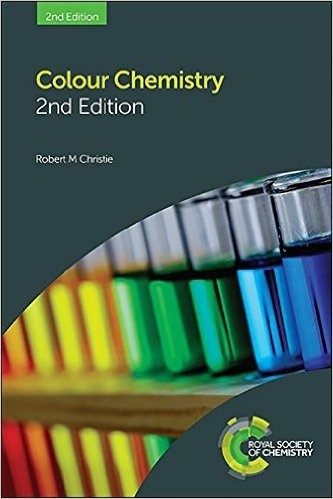 This monograph on color chemistry is concise, well-written, and with a little patience, accessible even for people like me who have only high school level chemistry and physics. If you are at all interested in how dyeing works, it explains everything. I’m also slogging through this one. It’s highly technical and I can only digest a few pages at a time, but it details all the general information in the first book. 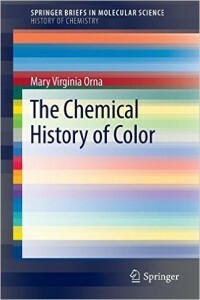 If you want more after reading The Chemical History of Color, then this is for you. Natural dyeing shows us that there are some plants and insects that impart good, lasting color, and some that are fugitive. The beginning attempts at synthesizing these color compounds were all trial and error, but now computer modeling can predict what wavelengths a particular molecular configuration should yield, and how to bind it to a particular fiber. It should be noted that two things dyers care about, light-fastness and wash-fastness are two separate issues. Light-fastness depends on the ultra-violet spectrums’s influence, whereas wash-fastness depends on the type of bond with the fiber (for the most part). Ultraviolet wavelengths can greatly influence the visible spectrum. We see this when colors fade in the sunlight. This often comes into play in natural dyeing (with black beans and berries for example)…one of the advantages of synthetic dyes is that they’ve been designed to be less susceptible to this effect. Another advantage of synthetic dyes is their leveling ability, that is, to dye evenly. They’ve been designed to bond weakly with the fiber so that they can actually un-bond and re-bond, rather than strike all at once in a concentrated area. Some of the molecules used to produce color are quite large, especially in the blue range. This is why even when using an acid dye, there is still blue left in the dye bath even though it is fully exhausted. The color producing part of the molecule is so large that it will actually break off from the part that bonds to the fiber during the leveling process. One of the mysteries of indigo is how it’s able to produce a blue color out of a relatively small molecule (there are several theories). Again to sum up, there are different types of bonds that can be formed, and they depend entirely on what you are dyeing: the amino acid chains of proteins, or hydroxide chains of cellulose plant material, maybe a mixture of both in the case of synthetic fibers, (or none of these in the case of polyesters). Animal fibers have positively charged receptor sites, so ionic bonding occurs with acid dyes (and also some hydrogen bonding, which is like ionic bonding but smaller). Plant material’s OH hydroxide chains don’t have the positve charge sites that animal fibers do, so fiber reactive dyes are designed to form covalent bonds, which are very strong, in a basic, rather than acidic bath. Disperse dyes dye plastics at high temperatures and pressures, although there are disperse dyes available for the home dyer that work in the dryer. Direct dyes work through a force called substantivity, and they need to be rather large molecules in order for this force to work. Since they are so large they are not particularly wash fast, and the colors are often duller. They are generally used on plant fibers, and are a component of all-purpose dyes like Rit. This post by Gnomespun Yarns does a good job explaining the difference between animal fibers and plant fibers, and how it affects dyeing. 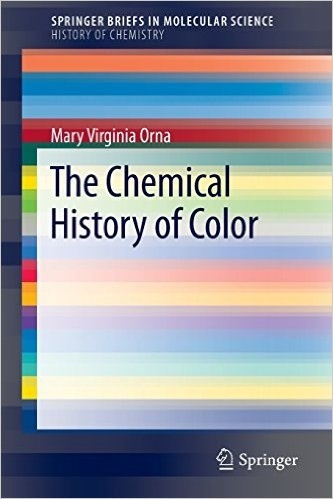 This one by Paula Burch does a good job explaining the different types of chemical bonds that are made with the various types of synthetic dyes. They are both well written, with nice diagrams, and really explain why it’s important to know the chemistry of what you’re trying to accomplish. All of this is by way of the next blog post, which is about mordanting. The chemistry of natural dyeing is only very recently becoming well documented, and I’ve found that understanding the technology that succeeds it is the most straightforward way of getting to it’s precursor. It’s so interesting to read about some of the differences between synthetic and natural dyes in how they work. I had no idea synthetic dyes had a levelling process, but of course that makes perfect sense. As for colours having different molecule sizes. Again. Who knew? Remember when we were talking about breaking colors when dyeing? How come a black acid dye, for example, will break into its component parts when you put dry fibre into the dye bath? What happens to that levelling quality in the dye? Good question! And good that you brought it up, because I want to address leveling in my next post on mordanting, too. Some of the answer has to do with the dyes themselves, and some of it has to do with how one is doing the dyeing. That said, I have some Kelly green Jacquard acid dye that reliably splits into chartreuse and an aqua blue. Part of the reason for this is I usually don’t wet out my fiber before I put it in the dye pot, so if the dye and acid are already in there it breaks right away. Leveling takes place in solution, and over time. If the wet dye is going into dry fiber, even if it’s got leveling potential, it won’t because it can’t migrate out again, it’s going to continue to get sucked into the dry parts (because osmosis). The uptake of the different colors takes different amounts of time, and they’re not necessarily combined in equal parts. So part of the breakage is technique. Breaking colors is a fun experiment. It’s interesting to see what you get and it’s amazing how quickly the breaking happens. When I dyed with weld, dahlias and marigolds I got a nice even color on wool and with cotton. The tricky one, I found was madder. I wonder if my dye liquor was too weak. Come to think of it I got a nice even color with cochineal too. I assume there aren’t any levellers in natural dyes. I guess mordanting helps the color strike, but also allows fiber to absorb dye evenly. Yet another reason it’s important to get right. Madder is a thing unto itself. I’ve just been reading up on it, and it’s fascinating. BTW, get yourself a copy of The Art and Craft of Natural Dyeing by Liles. Apparently the alizarin in madder is slow to dissolve, and the Ph of the dye bath really affects the uptake of the dye, along with the usual time/temperature/big enough dye pot factors. The mordanting process is time consuming and needs to be very meticulous, but you will end up with a dyed piece that’s comparable in light and wash fastness to any modern synthetic dye. If you’re not happy with the initial results you obtained with madder you can always mordant and dye it again, this was apparently common practice back in the day. Hopefully we will cover madder in my natural dyeing class!